Nestled just outside Phoenix in the heart of the American Southwest, the charming town of Gilbert, Arizona, offers an impressive array of couples-friendly activities. Whether you’re an outdoorsy duo ready for a hike around the Riparian Preserve or are self-described foodies looking for world-class cuisine, Gilbert delivers. From the popular farmers market, restaurants, bars, and cafés to the cultural enrichment opportunities of the art galleries and theaters — there’s no shortage of things to do in this welcoming, bustling Arizona hub. Gilbert has become the state’s fastest-growing community, and we’ve compiled some of the city’s best date ideas for couples looking for one-of-a-kind romantic experiences. For many, the mere mention of Arizona evokes images of the Old West and the great American frontier. The state’s history is fraught with legends of outlaws, gunfights, and adventurers seeking to play a role in Manifest Destiny. But, today, a New West has sprung up that celebrates the region’s storied past while delivering the cultural experiences modern couples crave. At the center of this movement is Gilbert, Arizona. Situated just southeast of Phoenix, Gilbert was voted Metro Phoenix’s Coolest Suburb and offers visitors a casual atmosphere with plenty of activities and an abundance of hospitality. It’s a great place to take a date and explore the impressive food scene, which landed it on the Top 5 Foodie Neighborhood in Metro Phoenix list. From goat yoga to nature hikes and visiting local artisans and craftsmen, Gilbert boasts a rich supply of things to do on a date or during a romantic lover’s weekend. To help you plan your outing in Gilbert, we’ve compiled a few ideas and recommendations, so you can experience the unique flavor of the city that’s quickly becoming a favorite couple’s destination. Begin your adventure in Gilbert at the Riparian Reserve. A conservation area protecting the local ecosystem and wildlife, it’s a great place to enjoy with your special someone. The Preserve also has some fun activities beyond hiking and biking. Grab your favorite fishing partner and a few worms and head over to the urban pond for a little competitive fishing (increase the love by throwing them back). For extra special date nights, time your visit to include a Friday night at the Rotary Centennial Observatory. Sky Watch Events are held on the second Friday of each month. You can do a little stargazing and learn about astronomy in a fun, social atmosphere. While you’re in a planning mood, the annual Gilbert Outdoor Expo is held at Riparian each February. You and your sweetie can learn how to kayak, meet some reptiles, or brush up on your hunting techniques. You can even take a painting class while you’re there. The Farm at Agritopia is a utopia of organic agriculture waiting to be harvested and enjoyed. The attraction is divided into three areas: the commercial farm, the community garden, and the Biblical garden. There’s room to walk the gardens and benches to reflect and talk with your significant other about the surrounding beauty. On Wednesday evenings, you can also stop by the farmers market just outside the Farm Store to enjoy the produce from the farm, yoga, and meet up with local vendors while enjoying food and drinks from nearby restaurants. After visiting Agritopia, Glenn recommends heading to Barnone — another must-see place in Gilbert. Barnone also hosts several events sure to keep visitors and locals entertained. Whether it’s the Garage East Live Music Concerts on Saturday and Sunday evenings or Night Time Nosh on Wednesday Nights, Barnone gives you an opportunity to experience Gilbert’s fun-loving community. If you’re looking for a romantic, elegant place for an evening dinner, Glenn told us Nico Heirloom Kitchen is one of the best date spots in Gilbert. Hand-rolled pasta, local ingredients, and family recipes abound in this West Coast seasonal-inspired Italian eatery with an elegant but approachable ambiance. It’s an ideal place to linger over a bottle of wine as you share multiple courses with your beloved. If you’re in the mood for an electric atmosphere and the best ramen Phoenix has to offer, look no further than Clever Koi. Guests get a front-row seat as staff creates steamed buns, dumplings, progressive noodle dishes, and small plates. The staff is also happy to help you partner your delectable eats with a wide spectrum of spirits, beer, wine, and sakes to ensure a perfectly balanced pairing. If you’re a craft beer lover, Gilbert’s your place. “We have this amazing brewery named Wilderness, which has been named the top brewery in the world,” Glenn said. Arizona is the main inspiration behind the owners’ passion for their beers, as the brews highlight Arizona’s agricultural community. The brewery offers a vast selection of beers spanning from saisons and IPAs to wassails, sours, and stouts. Every Thursday night you can join the brewmaster and team as they tap one of their ales. They also have a mouthwatering menu of casual but elevated meals to share. 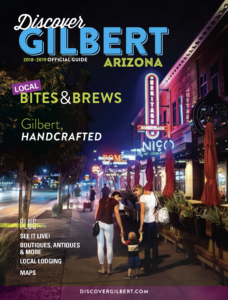 Gilbert is a land of foodies, and these are just a few of the culinary delights waiting for you Metro Phoenix. If you’re looking for the most singular experience you can have in Gilbert, Glenn told us goat yoga stands out among the herd. As the company slogan says, “Goats don’t judge — goats just love.” Come with your love to do some yoga and get more goat snuggles than you can handle. It’s like a big party full of happy people and lovable goats. It’s a definite must-experience while in Gilbert. Once you’re done getting your goat on, head out to the Heritage District to take in a musical or a comedy at the Hale Theatre. If you prefer visual art, head to Art Intersection to experience the exhibits on display or catch a lecture. With so many things to do, you’ll never run out of fun activities to try or inspired cuisine to taste. The fun, laid-back pace in Gilbert creates the perfect atmosphere to enjoy new experiences with your special someone.